Listen to blues while savoring barbecue slow cooked in a circa-1950s pit. : B.B.’s Lawnside BBQ has a circa-1950s pit for smoking, a dining room large enough for live music and a large parking lot to accommodate visitors. 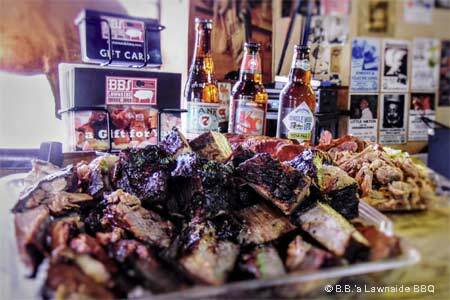 Owner Lindsay Shannon and his wife, Jo, chose to pursue a life combining their loves of barbecue and blues when they opened B.B.’s in the early 1990s. The menu includes slow cooked sausage, chicken, beef and pork, Louisiana-style gumbo, red beans and rice, jambalaya and a selection of beers.